2009 was quite the year for games on downloadable services. Whether your platform of choice was the consoles or the PC, there were definitely some games worth playing, worth thinking about and worth discussing. As far as console titles are concerned, the two big ones were probably Shadow Complex and Flower -- both of which did some interesting things in the digital distribution space and gave way to some fascinating discussion -- but for my money there was another title that was as good, if not better, than those two. Trials HD may have originated from the indie development scene on the PC, causing some people to scoff at the positive reception the Xbox Live Arcade release was receiving, but regardless of that there is no denying that the game was exactly the kind of thing digital distribution is perfect for, and I am definitely glad that I got the chance to play it. The best thing about Trials HD is definitely its accessibility: here is a game that is extremely easy because it uses just three buttons -- one for acceleration, braking and controlling the rider's balance -- allowing the physics to take care of the rest. 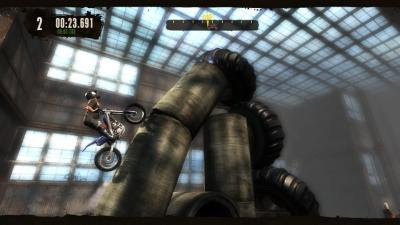 Anyone can play this game and enjoy it instantly, its experience similar to dirt-biking or performing stunts on two wheels but distilled to its most basic level. The beauty lies in the progression of the game's levels: the initial levels being easy affairs that demonstrate precisely why the game is fun while the harder levels contain puzzles that are absolutely mind-boggling, making failure a common occurrence and ensuring that you will be retrying over and over again. Despite the repetition the game is never frustrating, the player usually at fault for any mistakes, making way for that elusive "just one more go" mentality that a lot of games strive for but unfortunately don't successfully manage. All in all, it is a game that joins the likes of Geometry Wars and Peggle as one that I play randomly but consistently, and besides, like it isn't cool being able to double-flip off a massive jump and crash into an explosive barrel. I'm so glad this game made it onto your list. I spent many many hours playing this when it came out. It's simplicity and gentle learning curve really sucked me in, but before i knew it i was spending 3 hours and hundreds of attempts at one level in the hard section. By far the best part of the game for me is the online connectivity. I would spend hours doing the same level over and over again trying to gain a few precious milliseconds just so that i could be at the top of my friends leaderboards. And incorporating the leaderboards in at the top of your HUD while playing, so you can see just how close or how far you are from beating your mates, was just pure genius. Definitely a game i keep coming back to! Joel -- As you'd imagine, I could not agree more. I view the friends leaderboards integration as similar to the ghosts in a racing game, in that they are right there for you to see and can not only indicate how your friends did, but be the motivation you need to try and beat them. As much as I love racing games, I'd actually go as far as to say that I prefer Trials' method, as it's not in your face as much. You can glance at it, know where you stand and continue playing. It's simple yet effective, much like the game that surrounds it.